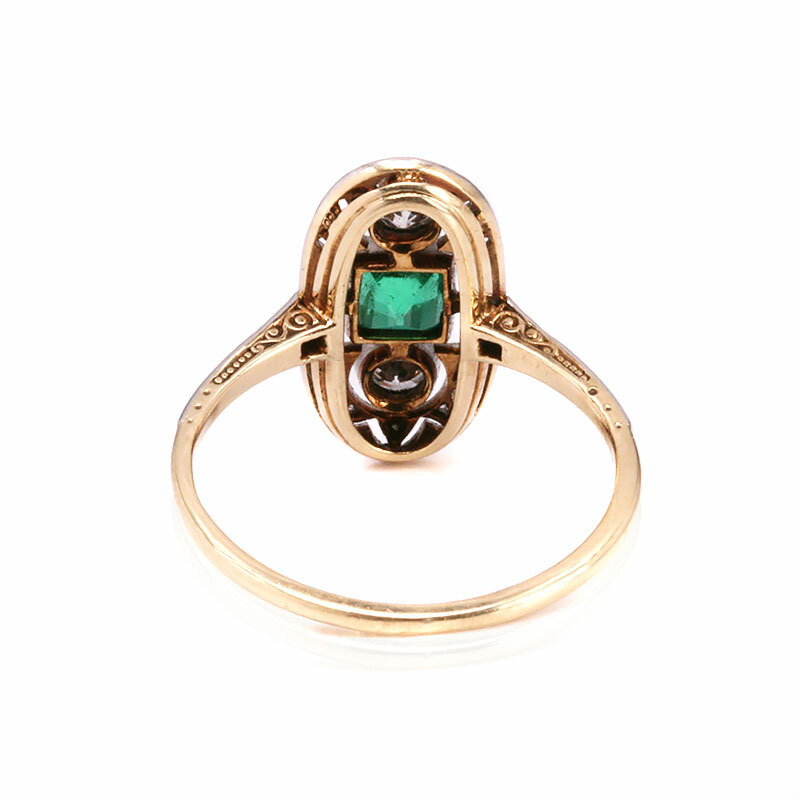 Product code: ES8353 Categories: Art Deco, Art Deco Rings & Art Deco Engagement Rings. 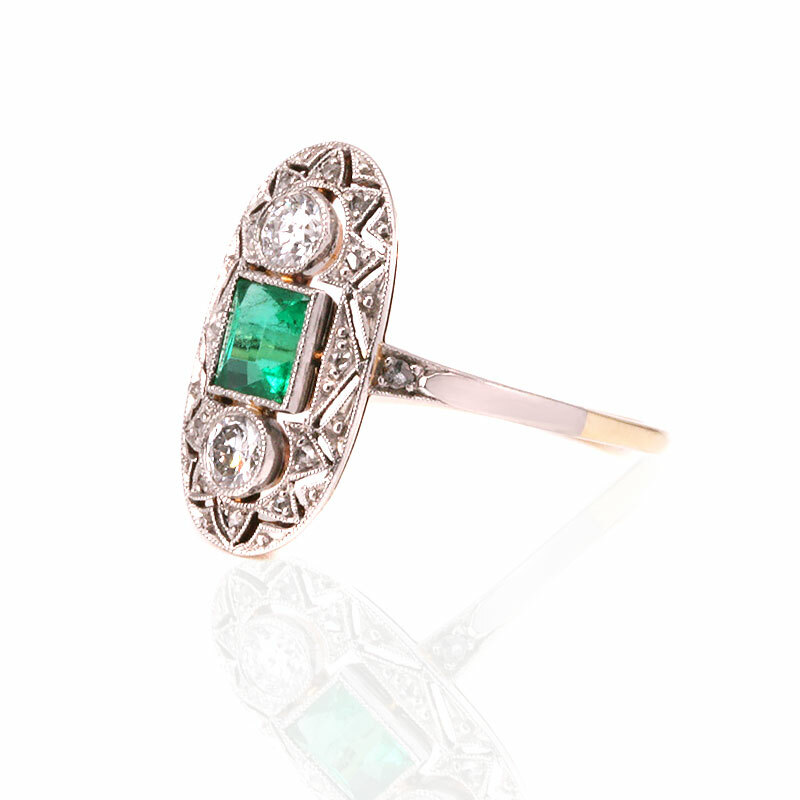 Here is a gorgeous emerald and diamond ring from the Art Deco era of the 1920’s that exemplifies the style and designs of this wonderful era that is as popular today as it was all those years ago. So beautifully hand made in 18 carat yellow gold and platinum the design alone is just so beautiful to admire. With the delicate pierce work seen in the border on the ring that could only have been made in platinum, as it is the only metal that is strong enough to be drawn into such fine wire and still be strong enough to support both the ring and the diamonds and emerald. And sitting proudly in the centre is a stunning natural Colombian emerald that has such a magnificent and fine green colour matched with perfect transparency that allows you to see right through the emerald. For centuries Colombia has been known as the home of the best emeralds in the world and this one certainly exemplifies this. Measuring 0.40 carats, above and below the emerald is one European cut diamond that come together to total 0.36 carats. And then incredibly set into that magnificent work and 14 rose cut diamonds that total 0.07 carats and add a delicate sparkle to the ring while also highlighting the magnificent work. Measuring 15.9mm by 8.8mm, the oval section sits atop the elegant band which has been beautifully hand engraved on the side to show how much thought and care went into hand making this ring during the fabulous Art Deco period. Perfect for any finger, this would also make a wonderful engagement ring, and regardless of the finger that it is worn on, it will no doubt always get the attention and admiration that it rightly deserves. In the centre there is a Colombian emerald and is set with European cut diamonds and rose cut diamonds. Hand made in 18 carat yellow gold and platinum, this ring exemplifies Art Deco jewellery of the 1920’s to the 1940’s. With such fine detail that could only have been achieved by hand making this ring, cast made and CAD rigns although very beautiful, simply do not have the attention to detail that a hand made ring can achieve.